Chickpea, cool season legume crop, is grown in several countries across the world as a food source. Seed is the main edible part of the plant and is a rich source of protein, carbohydrates and minerals especially for the vegetarian population. India is the largest producer of chickpea in the world with a share of 65.25 and 65.49 per cent of the total area (11.97 m ha) and production (10.89 mt), respectively. Major constraints for potential chickpea production are diseases, insect pests and poor management practices. In Andhra Pradesh, Chickpea is severely affected by wilt (Fusarium oxysporum f.sp. ciceri) and dry root rot (Rhizoctonia bataticola). In addition to these two diseases, Colletotrichum blight occurred in severe form during rabi 2009 and 2010 due to heavy unusual rains, which resulted in crop failure in many areas. 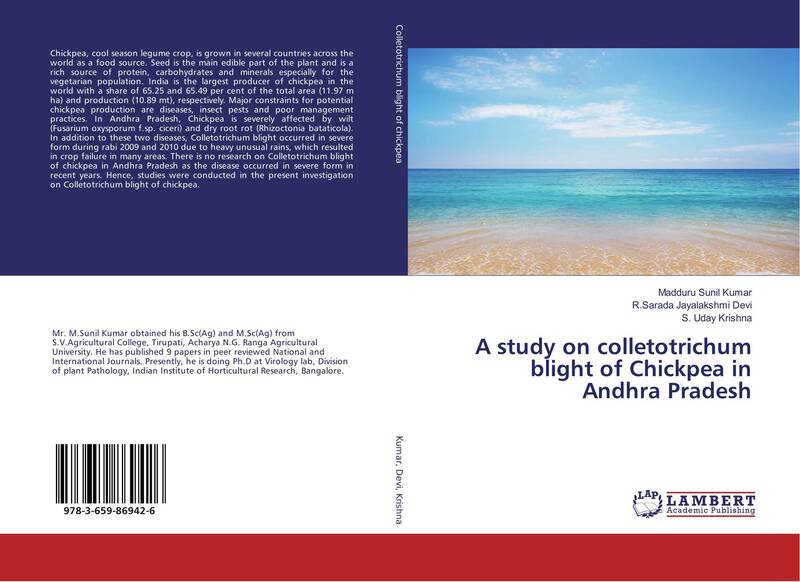 There is no research on Colletotrichum blight of chickpea in Andhra Pradesh as the disease occurred in severe form in recent years. Hence, studies were conducted in the present investigation on Colletotrichum blight of chickpea. 48 стр. / 4000 руб.